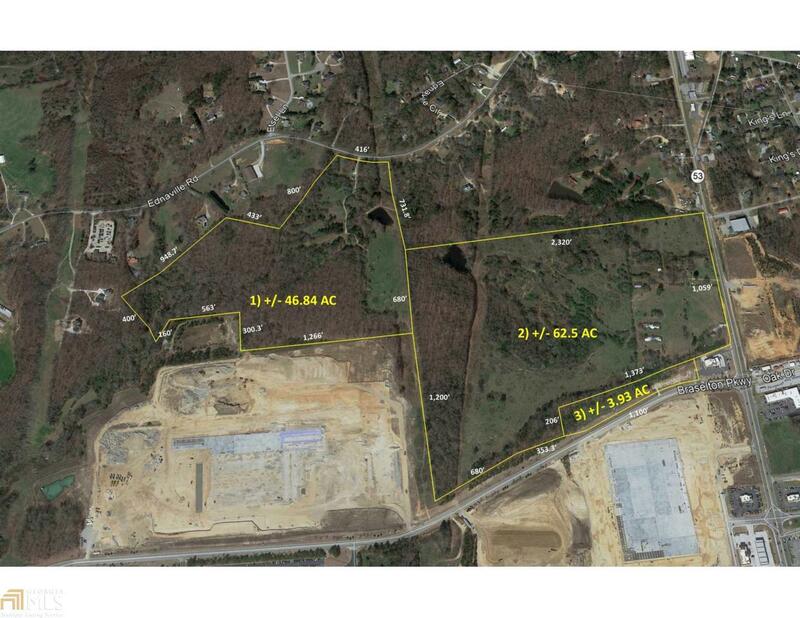 This is the offering of Tract 1: 46.84 +/- acres well suited for a residential development with frontage on Ednaville Road. This property has unlimited potential as it is just 1/3 of a mile from I-85 and also in a growing commercial and residential area. Highest and best use potential includes an assemblage with adjacent parcels for a mixed use development with residential, industrial and commercial components. The topography is highly desirable for development as it is generally level along Hwy 53 and very gently rolling towards the east end of the property. Together the assemblage would have 1,000' of frontage on Hwy 53, 410' of frontage on Ednaville Road, and 1,000' on Braselton Pkwy allowing for multiple entrances.